Spring Break in Italy; what other destination could top that? Myself and four other ACU students ventured out to the great country of pizza and pasta to see the sights and show some Italian pride. Along the way, we encountered what we came to call “movie moments,” those special times when we felt like we were living out a movie instead of real life! Basically, our spring break in Italy was magical! After spending time in London with my family, so I caught a 6 AM flight out of Gatwick (uh-oh! I booked a ticket for last week? Good thing they had one more ticket!) and made my way across the Italian countryside in a train to find my friends at the Trevi fountain. Not being able to speak Italian, I gazed around me with wide-open eyes, astounded to see luscious lemon trees in people’s backyards as I chugged past on the train. Thankfully, once I exited the train and got lost and found a couple times, I managed to find and board the metro towards the Trevi fountain. Upon arrival at the correct stop, I had to literally shove my way off of the metro train car. Wondering why the train was so crowded (I found out later it was Italy’s Unification Day festivities, which apparently lasted all week! ), I hustled towards the escalator and miraculously bumped into my friends! By the grace of God, we had boarded the same train and exited in perfect time to find each other. If I had not found them, I would have been utterly lost, and also soaked, since a downpour had initiated since I boarded the metro. After seeing the Trevi fountain, replete with “Roman guards” meandering around hoping tourists would pay for photos, we scrambled under overcast skies towards the Vatican (see photo). Inside, we were stunned, then slightly bored, by all of the paintings. In fact, there is so much breathtaking artwork inside, running up the walls and across the ceilings, that we were underwhelmed when we (finally) reached the actual Sistine chapel (that sounds horrendously appalling, that we were bored by the Michelangelo’s masterpiece. He’s still a genius! However, his work was outshone by my exhaustion and art overload). Sad, but true. Early the next morning, we arose to remember that the kind owner of our hostel knew not a word of English. Nor did we speak Italian. Thankfully, she managed to count out the change we needed for our payment. Hostels stays make for great stories; in this one, for example, though we had made a reservation for two girls (the rest of our group were in a different hostel…that’s a long story), there was only one bed. A queen-size bed, but only one none the less. With cheetah print sheets. Still, it was probably the cleanest, nicest hostel I have stayed at. After muddling through checking out of our room, we went to see the Coliseum. I was in absolute awe, thinking of the history which surrounded me (see two pictures). Enthralled, I could not stop looking at the Coliseum. That is, until I saw a couple in wedding dress down the street (photo). Our group joked happily about photobombing as we walked past the wedding party, staring openly. 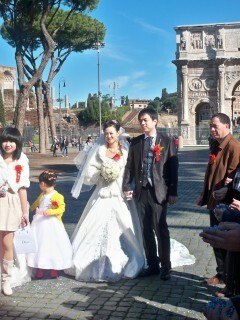 The couple was Asian (my uncle later informed me that in China, it is considered good luck to get married in Italy, so many wealthy couples host their weddings in Italian cities) and a man ran up to us speaking Chinese. We thought he was shouting at us to move out of the pictures (photobomb=successful!) but then he began gesturing wildly for us to follow him toward the wedding party. He lined us up with the wedding guests, then shoved confetti into our hands. He wanted us to toss the confetti at the bride and groom as they walked down the row of people! We were ecstatic, and knew we were in the midst of a genuine movie moment. Later that day, we went to buy our bus ticket to Milan. Only…there were no more tickets that day. Suddenly worried, we rushed to the train station to find a way to make our hostel reservations. We were able to, thankfully, and felt once again as if we had stepped into a cinema screen. Watching the Italian geography roll past, we grinned at one another, sure that our trip would be smooth. Unfortunately, we managed to miss our connecting train. In the confusion, one of our party lost her wallet. Then, the station manager told us (in Italian) that we had made a mistake (I can assure you, it was the train conductor’s fault) and had to catch a train which happened to be leaving right that very moment. We reached the train, out of breath, just as the doors slammed shut. Grasping for the door handles, we watched as a young Italian man on the other side of the glass reached out as well, hoping to let us on. Alas, the train pulled away from our reach and we despondently watched it puff away. We then had to wait a couple of hours for the next train. When we arrived in Milan, we had an interesting time finding our hostel in the late-night darkness but were relieved upon reaching it to find English speakers in residence. We were rather startled, however, when some things did not quite translate. For example, the next morning, the girl we were told would be joining our room turned out to be a half-naked man. Such are the experiences one finds while traveling abroad. 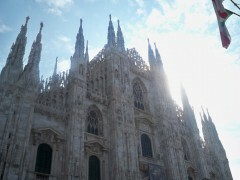 Still, our stay in Milan was quite peaceful. Well, aside from the vendors insisting we buy bracelets and birdseed. And when I say insisting, I mean they grabbed my friends’ arms and tied bracelets on or thrust birdseed in hands while encouraging pigeons to land and peck at the seed. 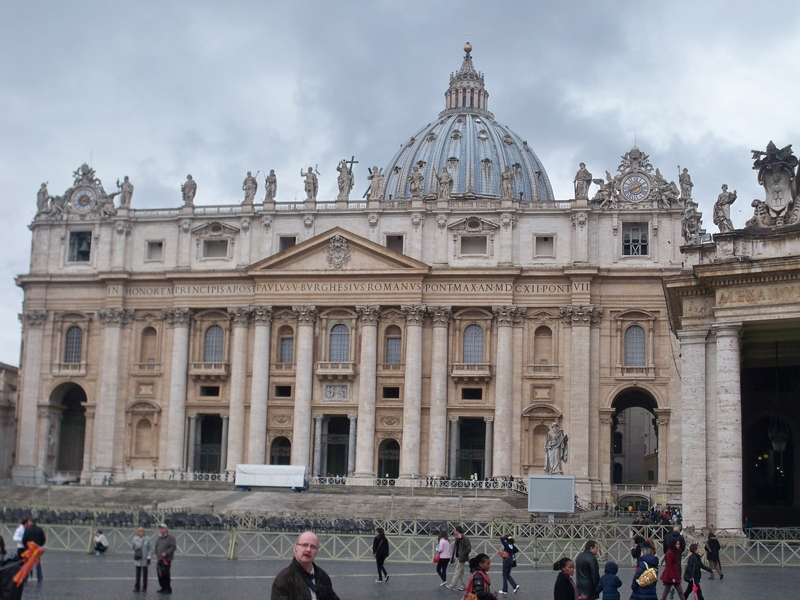 The vendors congregated in front of the massive Duomo, or cathedral (photo). We climbed a staircase up to the roof of the Duomo. We were then able to walk around the roof and watch over the city while admiring gargoyle’s grimaces up close. The rest of our trip really was smooth and enjoyable as we celebrated a friend’s birthday and took part in a Unification Day parade (we’re pretty sure we were on Italian television). Movie moments accounted for, bags packed and smiles intact, we made our way back to Oxford, knowing that this Spring Break would be hard to beat.